Quick tip: if you ever wake up in the middle of the night and see that there is a red moon in the sky, it is not a good idea to go out for a walk. Not even if you are just following someone suspicious. Unfortunately my advice comes too late to protect Chizuru, who decides, in Hakuouki Shinsengumi Kitan episode 5, to take such a walk. Patrolling Kyoto after the fires of the Dondon Yake. 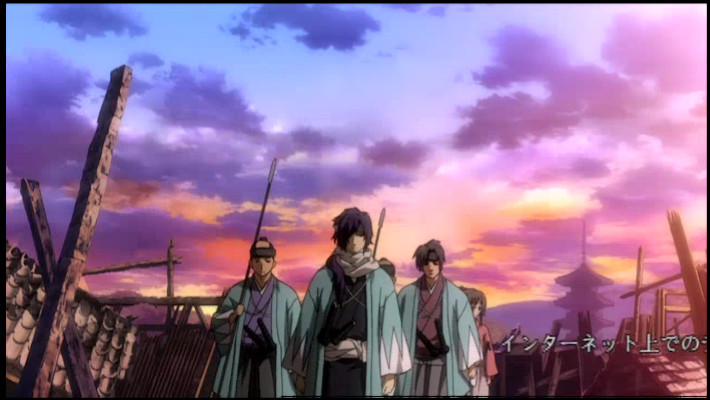 Despite a year of searching for her father, Chizuru and the Shinsengumi are no closer to finding him. The Shinsengumi have risen in favor after the Choshu’s torching of Kyoto, but the swelling of their ranks isn’t without a downside; new allies are not philosophically aligned with the Shogun. This causes splintering within their ranks, and Keisuke Sannan (whose injured arm has not recovered) feels the pressure to prove his worth. 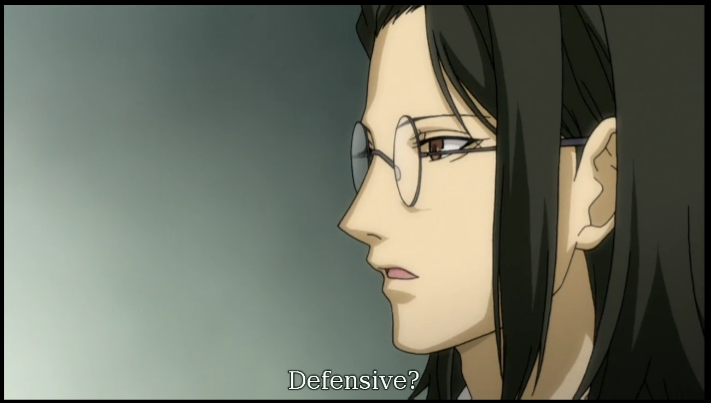 Sannan's capability to contribute is questioned by the newcomer Itou. As they say, one thing leads to another and Chizuru finds herself following Sannan through deserted alleys at night. 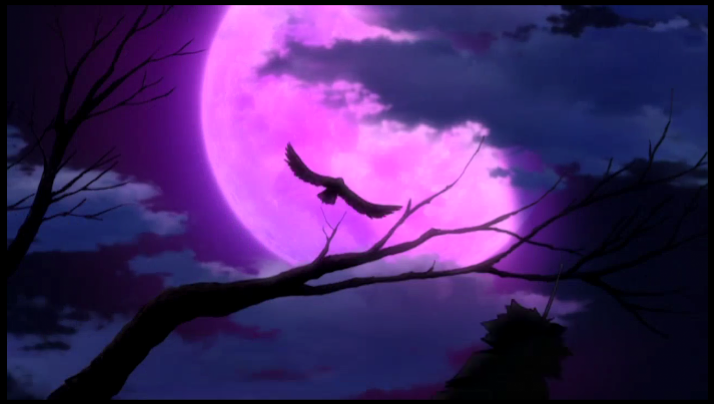 This sequence featured some nice suspenseful background music. Visually the sequence utilized many extreme perspectives, as well as an unstable camera position, and a very purple-oriented palette, that effectively conveyed a sense of walking, not just at night, but into a dream world. Unfortunately, as I said above, such journeys are bound to be dangerous. 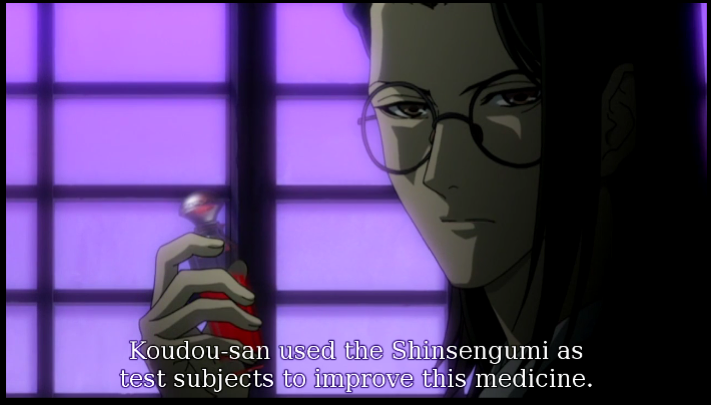 In this case Chizuru catches up with Sannan who has been replicating her fathers formula. As many have guessed, her father (Koudou Yukimura) created a formula that could make a kind of super-soldier, but the side effects create the demons we saw in the first episode. Are performance-enhancing drugs Sannan's only chance to continue as a warrior? This episode picks up the thread of the “failed soldiers”, and ends with a cliffhanger involving Sannan, Chizuru, and that red vial. It also spent some time describing how the political struggle in society between the Shogun’s supporters (e.g. the Aizu clan) and the Emperor’s faction (e.g. the Choshu), has now been internalized in the Shinsengumi, with the addition of Kashitarou Itou (which makes me wonder how far into Heisuke Toudou’s story we’ll get).